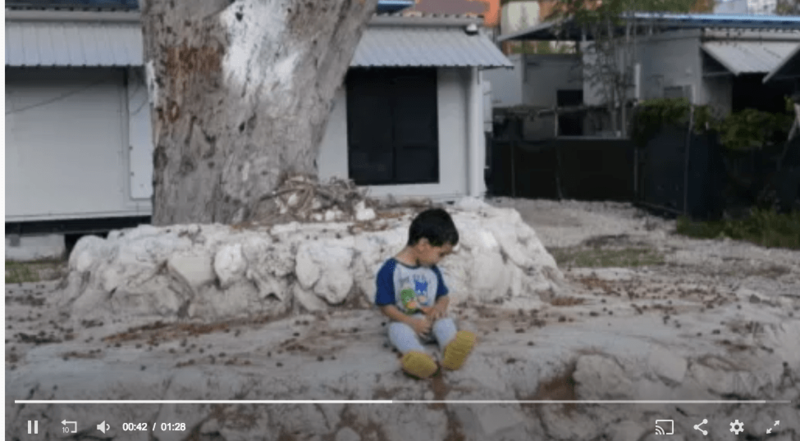 Asylum seeker boy detained on Nauru shown on ABC News 24. As Parliament debates whether doctors should be able to get children off Nauru, refugee advocates say longterm, regional solutions are needed. This week asylum seeker advocates have called for the Government to get serious about stopping people smugglers – by putting its money where its mouth is. Welcome to Australia’s Brad Chilcott said advocates are asking for an additional $100 million in Australian aid funding for the UNHCR to provide safe regional solutions for asylum seekers. Chilcott pointed out that the current Government cut $40 million from funding to the International Organisation for Migration – an organisation that works specifically in the Australasian region, providing options for asylum seekers in Indonesia to be processed officially. Prime Minister Scott Morrison highlighted the dangers of boat travel for asylum seekers during a press conference just this morning. The press conference was about legal amendments to Australia’s immigration laws which have been proposed by Labor, Greens and crossbench senators. Among other things, the proposed amendments would give doctors the power to bring sick asylum seekers to Australia for treatment – a power currently held by the Government. But Morrison said he will do everything he can to ensure the proposed amendments “never see the light of day”. The PM denied doctors should have the final say on medical evacuations and claimed it would be a threat to national security if the Government did not retain that power. Morrison said new laws would see people-smugglers in Indonesia back in business. However, the Prime Minister’s words likely will be to no effect given the support for the new laws (which are amendments to the Migration Act). In the Senate, the coalition is a minority and there are strong signs the bill has enough support to also pass in the House of Representatives. At the press conference, the Prime Minister appeared to be frustrated by the Government’s minority standing. He switched between comments about the Migration Bill amendments and the proposed Encryption Bill that is currently being debated in the House of Representatives. Morrison also attacked Opposition Leader Bill Shorten several times, accusing him of playing political games and describing him as “a clear and present threat to national security”. Referring to giving doctors the increased power to determine medical evacuations, Morrison said this would see people-smugglers in Indonesia back in business. “It will be in their brochures by this afternoon,” he said. Advocates such as Chilcott say that while the Government spends billions annually on deterrents, what really stops a person getting on a boat to Australia, engaging a people smuggler, risking their lives and the lives of their family, is the hope that there is another way. “Any time a person makes that risky decision, it is when they’ve completely run out of hope that there is another way to find a future and a life of safety,” said Chilcott. “By funding the UNHCR to a much more adequate amount, it will mean that these people seeking asylum will have UNHCR interviews, have their claims assessed, and have some hope that they may be resettled in a country that’s willing to welcome them. “The outcome would be empty detention centres, no one risking their life by paying a people smuggler and taking a risky boat journey, and an increase in displaced people being resettled.